What if long ago certain conclusions were made by leaders who may have been sincere but who failed to look upon the Jews with much favor? Perhaps their bias didn’t allow them to fully see God’s plan as revealed in the Prophets. Their conclusions were passed on to subsequent generations and came to form the tradition of how we today perceive the Jewish people: with a slightly negative undertone that causes many to view them in a manner inconsistent with God’s truth. Tradition is defined as an inherited thought or practice; a belief or structure of beliefs passed down through generations. It is the collection of various customs and beliefs that are already in place when we are born; thus tradition is the underlying basis for our family structure and cultural and religious practices. Tradition, in and of itself, is neither good nor bad; it is simply what one generation passes down to the next. One result of tradition is the concept of assumption: We assume what has been passed down is correct. In fact, not much thought is generally given to tradition—it just exists in the background, part of the culture we are born into. When a particular tradition is found to encompass error, we face an exceedingly difficult task to confront it. This is due in part to an individual’s natural tendency to personalize tradition; again, we are born into it and don’t even realize there is anything to question. When I was a young basketball player, I competed against a young man born without a left hand. He was not hampered by his handicap; in fact, he didn’t know he was handicapped because he had no frame of reference to understand what it might be like to function with two hands. When from birth we lack something, whether an appendage as in this case or perhaps a depth of information applying to certain religious beliefs, we simply have no way of gauging how new insights into our situations might affect any potential outcome. Because tradition is something we are born into, it forms the lens through which we interpret all we are faced with in life, whether religious or secular. Thus tradition defines us and is very much part of who and what we are as individuals and as a culture. Because it is so personal to us, and because we tend to be creatures of habit, when another addresses an error that might exist within our tradition, it often leads to a reaction. The result is often dissension and conflict, and nothing edifying ever comes from such matters. It is quite natural to become defensive when your tradition is questioned. An error within religious tradition is the most difficult to confront. It is almost never realized by those holding to it because we are raised to regard as incorrect any viewpoints that differ from our own. And because religious tradition is held so closely to our hearts, attempts by others to point out fallacies within our traditions are almost always met with negative reactions. This is one of many reasons for the existence of so many denominations and sects—divisions, if you will—within Christianity. We are not raised to see outside the boxes we are raised in; and yet in order to prove all things and hold fast to that which is true, we need to see ourselves and others through eyes beyond our own. As more and more Christians begin to identify as part of Israel in the nations, prophetically known as Ephraim or Joseph, we are confronted by another tradition that is deeply embedded in our religious psyche: the evangelization of the Jewish people. Our tradition tells us that we are to offer them salvation through Yeshua. Yet what if that tradition lacked a depth of understanding? What if long ago certain conclusions were made by leaders who may have been sincere but who failed to look upon the Jews with much favor? Perhaps their bias didn’t allow them to fully see God’s plan as revealed in the Prophets. Their conclusions were passed on to subsequent generations and came to form the tradition of how we today perceive the Jewish people: with a slightly negative undertone that causes many to view them in a manner inconsistent with God’s truth. For a very long time, this view from the Christian lens has assumed that Christians alone are saved and everyone else is destined for hell. But what if such a vantage point reflects a darkened lens, and only now is God lightening the tint so we can see a little more clearly? We might find, if we seek truth and have a teachable spirit, that some of the traditions we were born into have led us to miss certain truths. What if Yeshua’s work, while accomplished for all, might manifest itself in differing ways? Consider that Israel was divided into two nations—Judah (the Jewish people) to the south and Israel to the north. Israel, the Northern Kingdom, fell into a downward spiral of idolatry and ultimately was taken captive by Assyria. They remained unrepentant and would not return to the Land they were exiled from. The Southern Kingdom also distanced itself from God and His will at times, and ultimately they, too, were taken into exile—in this case, to Babylon. But Judah repented, and God brought them home. So one Kingdom was scattered into the nations and needed to be called back not only to the Land but also to the God its people had forsaken for idols. The other Kingdom returned to the Land, and despite not being perfect, they remained in covenant with God. From this understanding we can derive that Yeshua is the Door through which all will come, but the two nations will come from different directions. In the end, we believe, they will still go through the same door and reach the same destination in spite of starting off from distinct geographical and theological positions. Our tradition tells us that the Jews rejected Yeshua as Messiah. Unfortunately our tradition has so greatly blinded some of us to seeing that not only was Yeshua Jewish but so were all of His followers. We even find in Acts 21:20 that many thousands of Jews believed He was Messiah, and they continued being zealous for Torah (God’s Law). An interesting side note to this passage is that the Greek word for “many thousands” is murias—the numerical value of ten thousand. It also appears in the plural form, meaning that perhaps as many as twenty thousand or more Jewish people believed that Yeshua was Messiah. This concept is not consistent with our tradition; in fact, it stands in stark contrast to it. Throughout most of the last two thousand years, many Jews have seen Yeshua as the promised Messiah . . . but it is true that most haven’t. And if most haven’t, and if our God-ordained job were to convert them to our understanding of Scripture, then some important questions would surface. Have we failed? And in light of the fact that the Holy Spirit was given at Shavuot (Pentecost) to those who followed Yeshua, has God failed? Or is it possible we have lacked some additional understanding and that a different paradigm might help us draw a better conclusion? Obviously God has not failed—God is not capable of failure. I submit that we simply have been born into certain traditions and a paradigm that is not consistent with the first-century followers of Yeshua, and as such, we lack context that might allow us to form more accurate conclusions. As we begin to see outside of our paradigm and beyond those traditions that might not have allowed us to recognize certain biblical truths, we begin to consider new possibilities. What if the main focus of Yeshua’s ministry was not the Jewish people but rather those in the nations whom God promised to call back? Perhaps the paths of Judah and Ephraim were scheduled to intersect at a later date? Maybe we have inadvertently added to Scripture in the form of “time” where none existed or given an antithetical statement to a verse that lacked one. I probably need to clarify before going on: I am not suggesting that Yeshua’s work does not apply to Judah. I am not saying they have one way into the coming Kingdom and we another. I am suggesting that we look at certain aspects of Scripture to see if we have simply missed where and when God was placing certain priorities. If today we understand ourselves to be Ephraim, then we know that when Yeshua said, “I have not been sent except to the lost sheep of the House of Israel” He was speaking specifically about us—the House of Ephraim—and not about Judah. Since Yeshua singled out Israel in the nations and not Judah, does this exclude Judah from needing the work of Yeshua? God forbid! But Judah came home after their exile to Babylon; it was Israel who never returned from Assyria. The single most prophesied event in Scripture is the calling out of Israel from the nations and the reunification of both Houses, never to be divided again. Yeshua’s mission was already outlined in the Prophets, which is why He stated He was coming to call the lost sheep of the Northern Kingdom. He placed so much weight on that call that when He sent His disciples out, He told them not to go to Samaria, the former capital of the Northern Kingdom and a place Israel could not be found, but instead to the lost sheep of the House of Israel in the nations. This is why the Great Commission is to go to the nations and make disciples. Our tradition has not allowed us to conceive that we are part of Israel, let alone understand the weight Yeshua placed on calling us out from the nations in which we are scattered. This slight paradigm shift that we see happening today—this peering outside of our born-into tradition that allows us to understand who we are in God’s prophetic plans—is allowing us to see other matters that perhaps we have also misinterpreted. Earlier I mentioned God giving the followers of Yeshua His Holy Spirit. We have been rightly taught that the Spirit was given to teach, comfort, and guide, leading us in the ways of righteousness. But there is likely another reason that has been overlooked and might give us an additional witness in terms of the weight being on Israel and not Judah. What if the Spirit was given on that day to begin the construction—or perhaps better stated as the reconstruction—of a house? There is precedent in Exodus 35 when Bezalel the son of Uri was given the Holy Spirit to aid him in his work on the Tabernacle . . . the house of God. Our tradition has a hard enough time dealing with the fact that someone mentioned in Exodus even had the Holy Spirit, and yet Bezalel was given the Spirit “in wisdom, in understanding, and in knowledge, and in all manner of workmanship; and to devise curious works, to work in gold, and in silver, and in brass, and in the cutting of stones, to set them, and in carving of wood, to make any manner of cunning work” (Exodus 35:31b-33, KJV). With this in mind, we return to Yeshua’s words, “I have not been sent except to the lost sheep of the House of Israel.” He sent His disciples to the same lost sheep. Yeshua was building a house; He was rebuilding a house, the House of Israel, and He was doing it through all those who follow Him through the Spirit. The House of Judah, though having past faults that God dealt with and present faults he will continue to address, was not the house being rebuilt. Our paradigm continues to shift when we read this statement by Yeshua in three of the four Gospels: “I did not come to call the righteous, but sinners, to repentance” (Matthew 9:13, Mark 2:17, Luke 5:32; NKJV). How is that even possible? Our tradition tells us Paul was very clear: “There is none righteous, no, not one” (Romans 3:10, NKJV). Unfortunately, our tradition hasn’t done us many favors in this respect, as Paul was quoting Psalm 14. The Psalmist was speaking about those who were declaring “there is no God.” Context matters, and context is often the missing link that a faulty tradition tends to hide from us. Consider the line from Yeshua above: “I did not come to call the righteous.” It begs the question, Who are the righteous, and do we have a good definition of that word? As much as context matters, so does how we define words and concepts. In this case, the word righteous means “to conform to divine law.” So Yeshua is literally saying, “I have not come to call those who conform to divine law.” Who might He be referencing here? would be a good follow-up question. The Gentiles? No, they weren’t conforming to divine law. Israel in the nations? No, they were following idols. Only Judah was conforming to divine law—not every individual, mind you, but as a people, as a culture, they abided by the law. Not secular law—this wasn’t about Roman law. Righteousness is following God’s instructions, God’s laws. So when Yeshua said, “I have not come to call those who conform to divine law,” who else but righteous Jews fit that description? What about the rest of His statement—“but sinners unto repentance”? Again, a sound definition is required, and thankfully 1 John 3:4 provides us with one: “Everyone who practices sin also practices lawlessness; and sin is lawlessness” (NASB). Yeshua specifically stated He was not concerned so much with those who were daily centered on practicing God’s will as stated in Scripture; rather, He was concerned with those who were living without care for or knowledge of God’s Law. Does this mean that following the commandments perfects our decaying and dying bodies? God forbid! It simply means that when one comes in faith believing, the next step is not to pitch a tent at the Cross and remain there. Instead, we are to pick it up, so to speak, and be about the business of learning God’s will for our lives and then living it. If Jews in Yeshua’s day were not breaking commandments and were praying and living for God, then He wasn’t concerned with altering their walk; they were already living according to divine Law. But those who weren’t—like Israel in the nations—they were the ones in sin (without Law) upon whom He placed the greater weight to reach! Perhaps the Jews have some fences—commands around commands that we don’t understand, appreciate, or agree with—but a practicing Jew follows God’s Torah out of love, not because he thinks doing so earns him salvation. Our tradition has given us the notion that Jews believe works save, but the reality is they await a Messianic Kingdom—a coming Messiah and a time of peace and perfection—just like we do. It has also filled us with pride to the extent that after coming to Jesus, many of us were directed by pastors and teachers to “provoke the Jews to jealousy,” completely missing the context of Romans 11:11 by assuming the verse is speaking of provoking Jews to jealousy. It isn’t. It is speaking about provoking the House of Israel to jealousy, the ones in the nations who are without hope. Since Isaiah 11:13 declares that Ephraim is jealous of Judah, how can we provoke the Jewish people to jealousy when it is prophesied we will be jealous of them? Tradition can often be a great blessing, but it can equally become a cloud through which we cannot see. Often a cloud of confusion creates a climate of confusion. Sometimes it so pervades our paradigm that we unknowingly add to Scripture to support the conclusions that have been handed down to us. Generally we add time or an antithetical statement to a verse. For example, in John 3:16 we are told God so loved the world that He gave His Son, and all who believe in Him shall not perish but have everlasting life. Where in that verse does it say that we must believe now, at this point in time? If our interpretation of Zechariah 12:10 is correct, doesn’t it seem to indicate a time in the future when God might reveal Yeshua to the Jews? If there is no specific point in time for the fulfillment of John 3:16 or even John 14:6 (“No one comes to the Father but through Me” —NASB) and God seems to indicate in various verses that He has a future plan for Judah, then where else but through our traditions did we inherit the idea that we have the right to impose our timetable onto God’s work? Our tradition even weakens words so they no longer resemble their original intent. For example, what about the word believe as used in John 3:16—is it passive or does it demand action? Yeshua said, “If you love Me, keep My commandments” (John 14:15, NKJV). So does belief prompt action, obedience? What if a Jewish person who has not heard of Yeshua is already keeping the commandments? Isn’t that what Yeshua was desiring His people to do? By definition I believe that person would fall into the category of the righteous that Yeshua said he did not come for. The parable of the Prodigal Son might be one example of tradition clouding our visibility. Traditionally, Christians have understood this story to be speaking about, who else, two Christians. One was more mature and walked righteously, while the other was immature and, if it weren’t for the grace of God, would have no hope. A good Christian and a bad Christian if you will. But what if this story is speaking about something else? Considering Yeshua’s statement that He came for sinners and the lost sheep of the House of Israel, then what if the younger brother in this story is Ephraim? And what if the older brother, the one who never left his Father’s fields (read “covenant”), was Judah? We then have the older brother representing the Jewish people, who, though not perfect, have by and large remained in a covenant relationship with God. And Ephraim, the younger brother, has been squandering his inheritance in the nations and caring for earthly pleasures over heavenly treasures. If this interpretation is correct, it is quite interesting to ponder that Ephraim, the younger brother who walked away from God and found his way back only by the grace of God, nearly immediately sets out to correct his older brother, who has never left the Father. Such license was given to us through our tradition. The understanding we have of the Great Commission is one that doesn’t even follow the Greek used in this New Testament verse. “GO!—and make disciples” is how we in the West tend to read Matthew 28:16. We see it as a command to convert the world, including the Jews, to whatever form of Christianity we belong to. This is another example of unknowingly adding to Scripture. The Greek word translated as go is a passive participle; most scholars agree it is best rendered as going and should be paraphrased to say, “As you are going, teach.” The idea of the Great Commission is actually in line with Deuteronomy 6:7: “You shall teach them [God’s commandments] diligently to your children, and shall talk of them when you sit in your house, when you walk by the way, when you lie down, and when you rise up” (NKJV). So it isn’t a command to convert the world to Christianity; it is really a call to walk in a manner that reflects the will of God, and as we go, as we live—in all we do—to teach! We have a duty, an obligation to give an answer for the hope of our calling. We are to share Yeshua and His work with anyone who is seeking, because only when one seeks can he find. We have a responsibility to answer questions that have been asked, but we do not have the authority to virtually force others to accept our beliefs. Somewhere along our history highway, we reoriented the process described in Scripture. It is God who draws a man to Himself (John 6:44), and when he is drawn, when he begins to seek, only then will he find. Answers to questions that have not been asked will almost always fall on deaf ears. We cannot force another to accept our views, but throughout much of our Christian history, we have done just that to the Jewish people. Over the last two thousand years, we have seen forced baptisms; we have seen Jews forced to eat unclean animals; we have even witnessed the murder of Jewish people in the name of Jesus. These are acts of true heresy, but tradition, unfortunately, has also given us an alternate definition of heresy. Today it means “to not agree with orthodoxy,” but in the past the Greek underlying word (hairesis) meant “to storm a city; to take by force.” When we attempt to force another to accept our views, whether religious or secular, we are acting as heretics. An interesting side note to consider is that historically heretics were not those burned at the stake or those who lost their heads on chopping blocks; instead, heretics were the leaders who gave orders to light the matches and swing the axes! 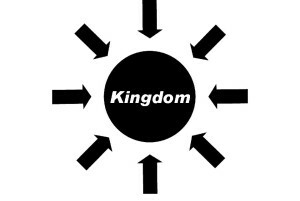 The arrows pointing toward the circle show that God is drawing all who are His toward the coming Kingdom. Whether scattered in the nations or living in modern-day Israel, the whole House of Israel—its members appearing in every color and speaking every language—is being drawn to a single place in time. While the illustration should make sense on this rudimentary level, here is an aspect that does not: Imagine, if you will, that Ephraim is on the left side at 9:00 and Judah is on the right side at 3:00. Ephraim’s interpretation of the Great Commission and other aspects of the New Testament compels us to leave our place at 9:00 and go to Judah at 3:00, only to bring him back to our location to make him look, act, and think like we do—in spite of the fact that God is already bringing us both toward the Kingdom at the center. Our destination is the same, and God twice promised through Jeremiah the prophet that He would correct us in due course. All of us need correction, and God promised to provide it. Yet we as Ephraim still feel compelled to conform others to our viewpoint. There is a wonderful picture provided for us in Ezekiel 37. The prophet is told by God to take two sticks—one for Judah and the other for Joseph (Ephraim). Ezekiel holds them in his hand as if they are one stick, and then God makes them one in His hand. The point is that before God does His work, He expects Ezekiel—and I believe Judah and Ephraim by extension—to treat both sticks as if He has already made them one. It will take a massive pride dump in order to treat the two sticks as one when you consider that (1) we as Ephraim have a hard enough time treating our own stick as one; (2) Ephraim sees Yeshua as Messiah; and (3) the stick of Judah does not hold this same belief. Yet until God makes the sticks one, we remain two individual sticks, two individual peoples. That means we need to look beyond any theological differences for the good of the body as a whole so we might actually treat the two sticks as if they are already one. Think about how difficult an assignment that is. Think about the barriers of tradition that must be overcome in order to do the will of God in this task. It is, for me, one of the most humbling undertakings I have ever faced. It is perhaps the greatest undertaking that has stood before all of us. We need to learn how to belong to a people who are scattered among the nations, accepting that our nation is larger than what we can currently see; we must also acknowledge that when it comes to theology, we have great differences of opinion with the other house. And yet still we are to treat the two as one. Humility and prayer are the keys: learning to live with mutual respect and understanding. Judah will remain Judah and Joseph will remain Joseph until God makes the two one. No longer can we engage in theological shoving matches. No longer can we afford religious posturing. If what we believe about Yeshua is correct, then we must trust He will fully reveal Himself to Judah in His timing. Perhaps that is what Zechariah 12:10 is declaring to us. And what if we should learn we arrived at certain conclusions in error? Well, that is a possibility no one ever desires to entertain. Yet one thing is clear: Both Houses have fixed their hearts and eyes on the God of Israel, and when Messiah comes, we will all stand corrected on more issues than we will be comfortable with. Until that day, my dear brethren, let us just walk together in unity, treating our two sticks as if they are already one—and may this tradition become the framework we hand down to those who come after us.